TPS Singapore, Race 2: Great Run in the Northeast, Lucky to Have the Great Weather | JustRunLah! 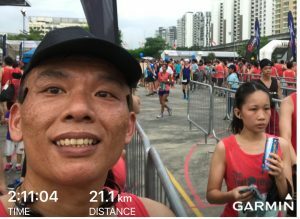 The second leg of the 3 parts TPS 2017 ran along the scenic Punggol Waterway and through Coney Island. Frankly, I was disappointed when the route was announced because we did the same route for race 1 of TPS 2016, and remember the roasting experience due to the late flag-off. So after the route was out, I wrote in to the organiser to request for review of the route direction and hope we can start earlier possible to avoid the sun and also the other park users. Although the direction had changed, but the flag-off time remain as 7am, so I told myself to forget about PB although is home-ground. The congestion at 5 – 7km was as expected because that path is too narrow to be divided into 2. And considering the usual heavy human and bike traffic, it is definitely a portion to get away as fast as possible. So I tried to move forward and stay ahead of the pack. I can see the main pack coming after the U-turn, overtaking is almost impossible. The route after crossing the bridge to the other side of the waterway is generally smooth and easy. This time we have cold sponge which was nice, I kept it on my head till the end to cool my head. Overall I enjoyed this run, lucky to have the nice weather, I managed to improve 7 mins. 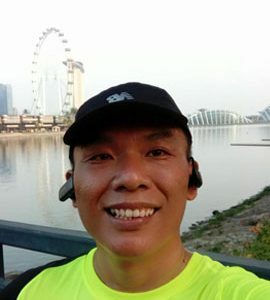 There are not much routes for 21km in Singapore, most commonly held around Garden By The Bay and East Coast. Its nice to have new routes and this is a good one. While this route has some negative parts, I think this is best we can have with the constraints, so we need to manage ourselves and plan our race. Looking forward to Race 3 @ Changi. Hope the flag-off will be 5am as there are not much trees in that area and many construction sites. Lastly I hope our fellow runner who fainted at the finish line is fine now.